Arrgh you tough enough to defeat pirates on the open sea? Arrgh, another sea-faring game within a short span of time for me. However, Pirate Code is released and finished. Also, it’s nothing like the other one I just reviewed. Pirate Code is about fighting pirates. Lots of pirates. Tons of pirates. I’m trying to say there are a lot of pirates. However, there is so much more to the game that I doubt I’ll be able to get it all in here. You start as a young rogue, learning the ropes from her dad. Once the two split apart, the father goes off on his own mission, leaving you with your own small, starting fleet. By small, I mean three ships. 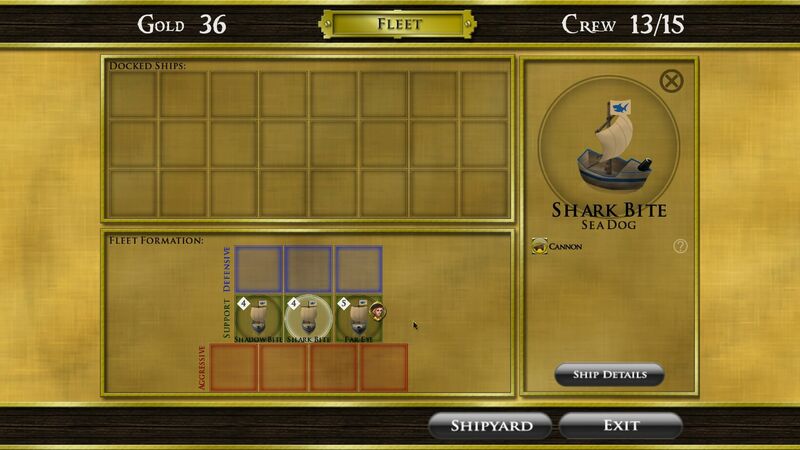 You have two Sea Dogs with a range of two hexes and one Wolf, which has a range of three hexes. 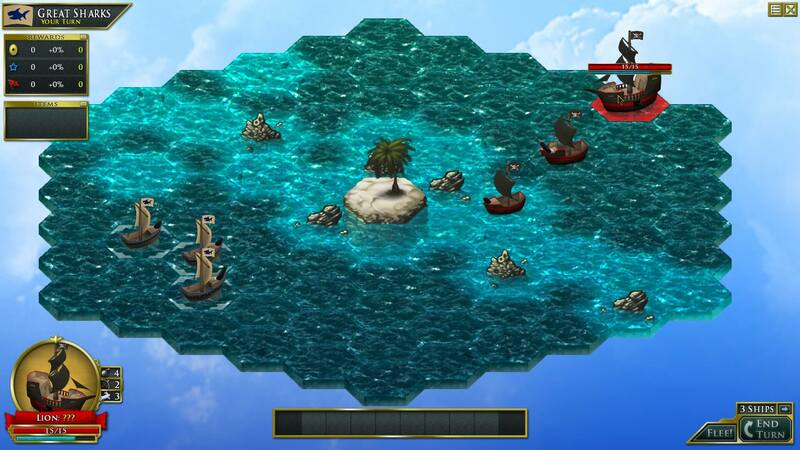 Pirate Code is a mix of real-time (while in the open sea) and turn-based combat. Most of the action takes place during ship battles. Being a turn-based fanatic, that makes me very happy. The very strategic part is learning how different ships operate. The two I mentioned are very basic, one-shots — at the aforementioned ranges. Unlike a lot of turn-based strategy, the interesting/technical aspect is that they are only good at those ranges. This means your Wolf, with a range of three, cannot shoot at something one or two hexes away… it has to be three away. You have to carefully plan where your ships will fire from, as well as paying attention to the enemy’s ships and their ranges. And generally, if not outnumbered, you are at least outgunned. A lot of times, both happen. How come I don’t have a huge ship like that? Each ship also has a special ability it can use during battle. You always captain a ship, as well, and you can teach your ship a special ability while commanding it. Once it’s experienced using it up to a certain point, it has learned it and will still be able to use it even when you leave to captain a different vessel. For example, the Sea Dogs you start with have Victory Yell. When used during a fight, that ship plus any adjacent ships get a morale boost and some repairs. Morale plays an important role in Pirate Code, which I’ll discuss later. Finally, the ship you command gets bonuses of extra attack strength and life. 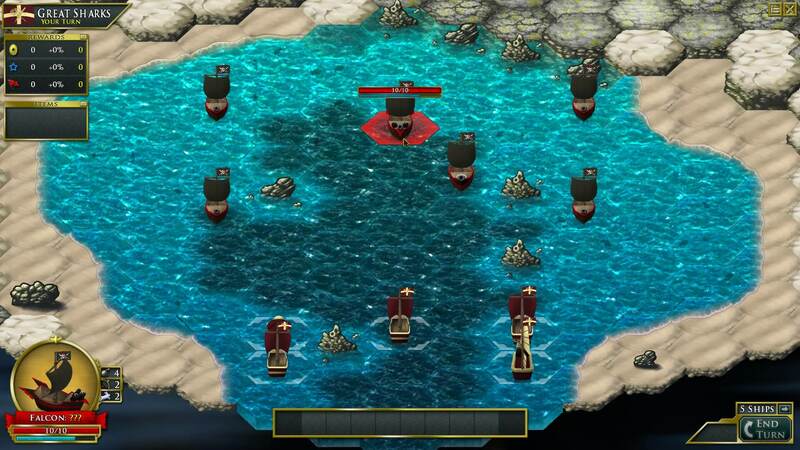 Learning each ship’s abilities and firepower is key to sinking pirates. As you slowly unlock new ships, some can fire at multiple targets — if you can position yourself correctly. Actually, the way I learned how most ships worked was by watching the enemy’s ships — they got bigger, better armaments and vessels waaaaay before I did. That’s part of being outgunned, as I mentioned before. Some ships can fire out of each side; some can fire at two targets, but they have to be a space apart; etc. When you’re in a battle and sink a pirate, you gain gold, experience and liberation. 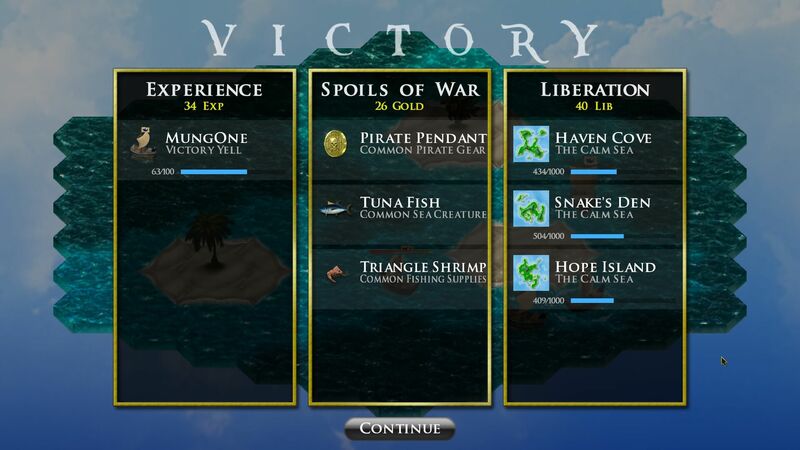 A big part of the game is liberating all the islands from the Pirate League that controls them all. This is where morale comes into play as well. When a ship sinks, that side’s other members suffer a morale loss, seeing their friends sink and die. That goes for you as well as the pirates. On the flip side, when you sink a ship, your side (or theirs, if they’re killing you) gets a morale boost. A ship with a captain will never surrender. However, I had quite a few battles in which I sank every ship but one… and the final one would just surrender due to their morale being shot. The spoils of war…with Liberation. 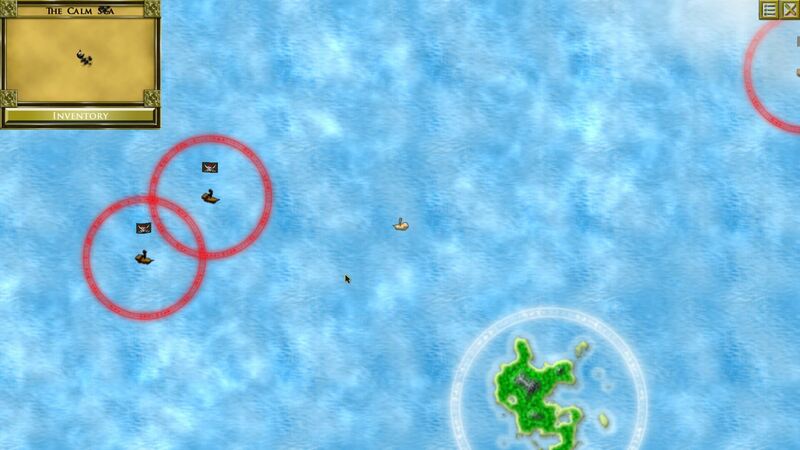 When you’re out in the open sea, pirates cruise around with either red or gold circles around them. The gold ones are more experienced captains with better fleets, so they’re harder to beat. However, if defeated, they give better rewards. All you have to do is touch the edge of their circle and you’re instantly in combat. I already mentioned it was real-time when out on the open waters. Being 147 years old, I’ve got to admit — it moves pretty quick out there. Plenty of battles were not intentionally initiated by me. It takes a bit of getting used to, sailing around. Assignments, bounties and challenges get offered right away. Assignments are generally the main storyline. You can take up to four bounties at a time and repeat them many times. Challenges you want to hold off doing until you’re quite a bit tougher. As you progress, you get blueprints to build different kinds of ships. Your fleet takes crew members, who are found and hired in a variety of ways, so your fleet size is limited to the number of crew members available. Another great aspect of Pirate Code’s immersion and gameplay. Two of three Challenges completed. They’re tough! Your first ‘chapter’ consists of three islands. You have the freedom to do whatever you want as you’re playing. You don’t have to follow the story alone. There are plenty of other things to do, generally — not always by killing pirates, but still. There are these red dashed lines around your ‘area’. It’s a pretty large place. But I thought I’d be cool and cross over them to see what was beyond. Newp. They’re there for a reason — you have to unlock each section of the map as you go along. If you try to cross the border, it just keeps throwing your ship back to where you’re supposed to be. This is tied to the storyline. You’re taught to fish relatively early. This doesn’t mean you sit on a dock and try to catch stuff — it’s actually used in battle! It’s odd, but fun, being in a big fight and having a ship in a position to fish before doing something else with its turn. You want fish to sell them, but also to add them to your collections. As you progress, you’ll also learn things to do with the little land areas in some of the battles. No, I’m not telling. 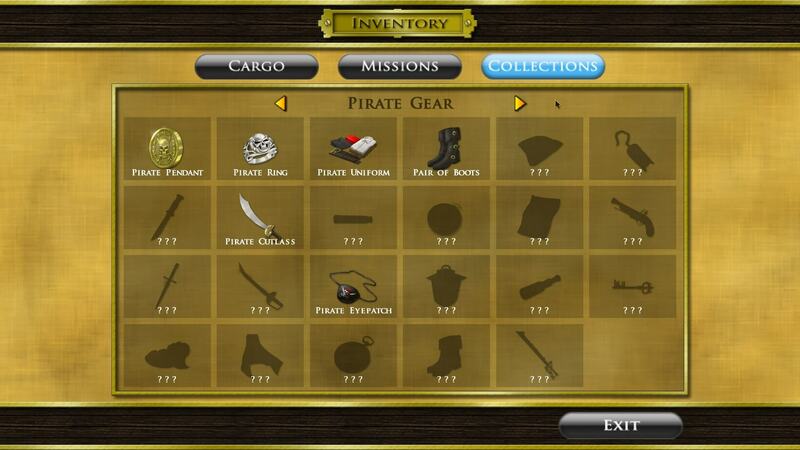 There are many types of collections in Pirate Code. Sea creatures, vegetation, pirate gear, clockwork gizmos and Molo artefacts, just to name a few. Little tip: all you have to do is have them once and they’re in the collection. You don’t have to hang onto everything — something I can’t say I quickly learned, but at least I did eventually. Just one of many collections. Another cool part of Pirate Code is the weather changes. There are storms, fogs, etc. that affect your travelling and fighting. Just another great addition to — I’ll say it now — an extremely addictive game. You can buy various items from different shops, once unlocked. An early one is the bait shop for your fishing supplies. You can also spend money to change your flag. The only Xbox I ever had was the first one. I got Forza Motorsport for it. People had talked about customizing their cars. I thought that was idiotic because I got the game to Race, dammit. However, a couple of cars in, I started customizing them. That led to millions of hours of fine-tuning my livery exactly how I wanted it. The same thing happened with the flags in Pirate Code. At first, I thought, ‘Why the hell would I spend good money customizing and playing with the flag? It’s just a basic flag, what do I care?’ Then I had some extra money and got curious about what the different colors and patterns would do. The same thing occurred. I’ve spent literally hours messing around with that flag — changing the colors, insignias, patterns and positions. Does this look better or should I do it like that? The colors also change the way the ships look, as well. I’ve got tons of screenshots… which look like different navies have been playing. Needless to say, I exceedingly enjoy playing Pirate Code. So many different things happen all the time. Each battle is different and you have to really strategize your way out of each one. They bring too many ships. They bring bigger, tougher ships. They bring in new ships that I’ve never seen or faced. What the hell does that one do? How am I going to possibly win this one? The buying and selling mechanics change at each port. There are bounties, ‘gold’ pirates, challenges and little side missions. The main thing about getting into a brawl? You’re just running into a red circle that has a little pirate ship in the middle of it. You have no idea what their fleet makeup is. I can almost guarantee it’s better than yours, though. It’s simply a blast to play. My wienie fleet at the bottom, their large fleet at the top. Pirate Cove is available now on Windows PC.